Preheat a non-stick griddle to 325 degrees. In a mixing bowl, whisk together flour, sugar, baking powder, baking soda, cinnamon, nutmeg and salt, set aside. In a separate mixing bowl whisk together buttermilk, milk, mashed bananas, sour cream, egg and melted butter. Add dry ingredients to milk mixture and whisk just until combine (batter should be slightly lumpy, don’t over-mix or your pancakes won’t be as fluffy). Pour about 1/4 cup mixture onto buttered preheated griddle and using the measuring cup slightly spread the batter outward keeping a circular form (this helps them to be more even so you don’t get the fat center and thin sides). Cook until bubbles begin to appear on the surface and bottom is golden, then flip pancake and cook opposite side until golden. 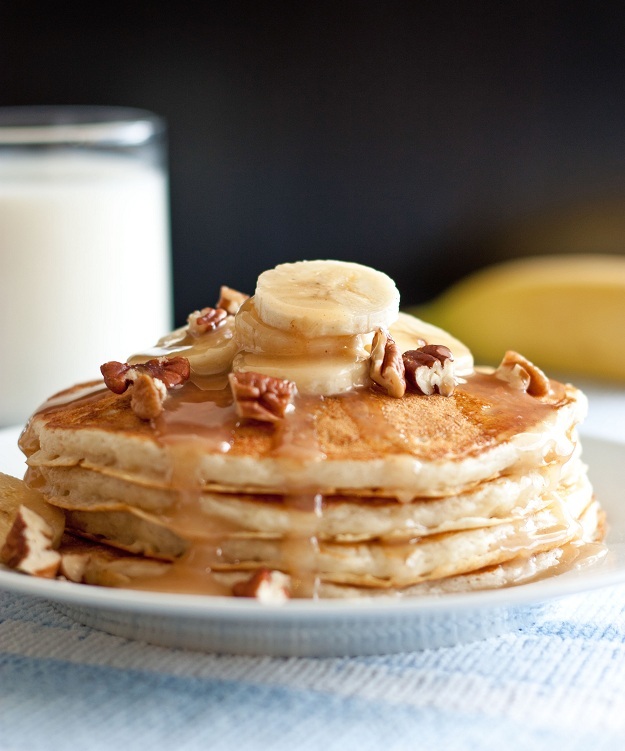 Serve immediately with Cinnamon Cream Cheese Syrup and garnish with optional banana slices and chopped nuts. Melt butter in a large saucepan over medium low heat. Stir in sugar, cinnamon, buttermilk and cream cheese. Cook mixture, whisking constantly until cream cheese has melted. Stir in baking soda and whisk for about 10 seconds until very frothy. Remove from heat and stir in vanilla. Serve warm. Store in refrigerator up to 1 week. Note: leftover syrup is delicious over oatmeal, especially with a ripe banana mixed in.